Although I wrote everything I know about squirrel issues for this website, oftentimes a problem with squirrels in the attic is beyond the scope of the do-it-yourself homeowner to solve. I have found a professional company in Waco, Texas that handles problems with wildlife. Wildlife X Team has access to tools, techniques, and experience that help them do a far better job at wildlife removal than a non-experienced homeowner could. They possess licensing that allows them to do certain types of work legally, that non-licensed homeowners in the state of Texas are not allowed to do. For the welfare of your situation, and the squirrels, in some cases it's best to hire a pro. There are good companies and bad companies out there. I've done research on such companies, to get to know them, and feel confident recommending their services. I therefore recommend a company called Wildlife X Team which services Waco, Texas. If you have a squirrel problem, or any other conflict with a wild animal, and live in Waco, I am confident that this company, Wildlife X Team, is the one to call. I asked the company to describe their service range, and they said this - We service the following Texas counties: Bell, Coryell, Falls, Mclennan, Milam, and Robertson. We service these cities: Temple, Belton, Waco, Killeen, Lampasas, Copperas Cove, Gatesville, Salado, and all surrounding areas. Wildlife X Team operates 24/7, so don't hesitate to call at any time to discuss your wildlife problem, and schedule an appointment for same-day or next-day service. David, I have been perusing your site about squirrel removal. We have been waging a four year battle with the critters. 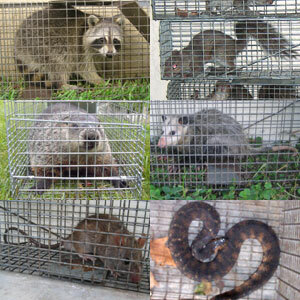 I smiled at all of the things mentioned as we have tried most of them, and was surprised to find that we have likely been breaking the law in trapping and releasing them in other areas. (I will be looking up the codes shortly.) We have always done our best to remove them in the most humane means possible, but I am seriously considering training a falcon to start picking them off. Thanks for all of the information. We have recently had a new development that raised a question that I am hoping you can answer. The area of roof that they have infiltrated is completely inaccessible through our creepy attic. One of the beasts has seemingly kicked the proverbial bucket in this area of roof and the smell emitting is something to behold. The question that we have is will this decomposing rodent cause the others to vacate? Feel free to tell us that it will, even if it isn't true. We are holding onto this hope as a silver lining to putting up with the smell. have been trying to catch a squirrel. After 5 days I got it. On the way out the door I heard scratching from above( this is why I decided to trap the squirrel in the first place).Well I released the squirrel miles away and returned home. When I got home I heard the scratching again. I opened the attic trap door and was met with the glowing eyes of 2 squirrels. Although furry the appeared to be slightly smaller than the one I caught. My question is will these 2 juvenile squirrel eventually leave or will they just give up and die in my attic. I have a cedar shake roof and have been unable to locate their entry point. I have place the trap in the attic space but have read that they probably won't take the bait. Any suggestions will help. Thanks, Doug in Waco. If you have a squirrel problem in McLennan County Texas, or any other conflict with a wild animal, I am confident that we can solve it. We use humane methods when dealing with Waco wildlife removal situations. Squirrel Control Waco. Our company is fully licensed and insured in Texas. Call us any time at 254-534-6170 for a price quote and to schedule a same-day or next-day appointment to solve your squirrel problem in Waco.